Between Bitter And Better. Can I Do It? Today I’m featuring a guest blogger. This lady is beautiful, funny, and she loves the Lord! She’s been through a lot and has every right to be bitter; but SHE’S NOT! 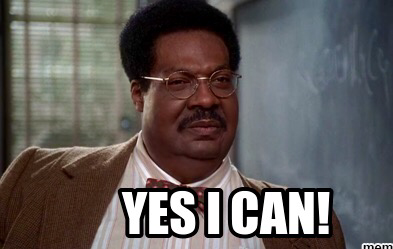 Reading her blog reminded me of The Nutty Professor. And YES! I think she can! And so can you! Today, I was sitting here thinking about marriage, divorce, rejection, and hurt. Somewhere the words anger and bitterness crept in. I began to wonder if, as a Christian who is newly divorced, if it’s ok to be bitter or angry? If you have ever been divorced, then you know that divorce comes with a plethora of things including emotions, or feelings that make absolutely zero sense to any rational human being. How can I get angry, or upset just because I see a box of Mike and Ike’s at the dollar store? Because “he” ate them that’s how! How can Michael Jackson’s song “Remember the Time” have me running at full speed, out of the mall, knocking down folks in the process? Because that was “our” song that’s how! There’s so many things I now avoid because of “him” or “our”. Shrimp, (not short people but the shellfish). Mustangs, (the car, not the horse) The First 48, Swamp People…yeah, I miss Swamp People. Giving up, or losing things isn’t very much fun. It hurts. That hurt then shows its ugly face as anger and then…you got it, bitterness. But guys, if we give in to bitterness, a root will begin to grow in our heart. It can entangle us from the inside out, and suffocate the life right out of us. It begins to wrap around our entire being rendering us immobilized. How can we prevent the entanglement of bitterness? We have to go to God. We have to get in The Word. This is not as difficult as small engine repair here! It’s simple. Hit your knees and pray! Get that dusty Bible off the table, open it up, and read it! If we don’t want to do those things, then we’ve most likely allowed another sin to creep in; its called pride. Sometimes we are too prideful to admit that we need help. We justify our anger. We get others to validate our bitterness. “He or she cheated.” “He or she took the dog in the divorce.” “He or she left you owing a $956.31 light bill.” Give or take a dime. Who cares? It’s over. You gotta get up, and get about forgiving! And yes, you can do it. You can forgive. You can pray. You can live again. You can live joyfully. I love each of you Precious Ones. Previous Post Why Did You Have To Go?! Next Post Doing The Next Right Thing Is Much Better (and easier) Than Going To Hell!